When it comes to buying life insurance coverage, many of us focus on the family’s primary breadwinner. 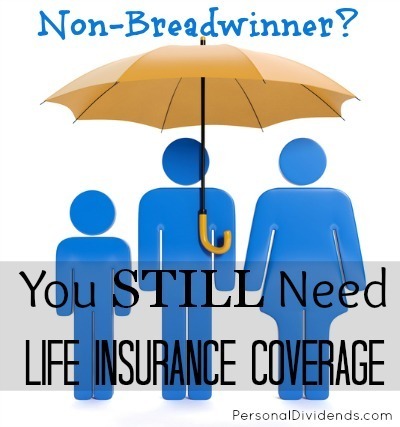 While you do need life insurance for the primary breadwinner, don’t forget that it is usually a good idea to get coverage for someone who isn’t the primary breadwinner. Consider the household finances as a whole, including the non-financial contributions that a stay at home partner makes in order to prevent the need for paying for certain things. What Does Your Stay at Home Partner Contribute? Michael Venable of Hopkinsville, Ky., lost his wife, Beth, from a stroke following brain surgery on August 24, 2012. Michael was left with four young children, including a new baby adopted from Ethiopia. Fortunately, the family had a life insurance policy for Beth that has allowed Michael to hire a nanny to help with the kids while he’s continued his work as a State Farm agent. The life insurance proceeds have also allowed Michael to carry on Beth’s passion of serving others, especially orphans. Michael has raised more than $50,000 for a charity for orphans. Michael knows first-hand the importance of having life insurance on both spouses in the event of an unexpected life change. As you can see from Venable’s experience, there is a lot that goes into being a stay at home partner. Think of all of the things that your stay at home partner takes care of. From picking the kids up after school, to running errands, to getting dinner started, there’s a lot that goes into being a stay at home partner. After you consider what your partner does, then consider how much it would cost to hire someone else to do it. Because you can’t if you are going to keep earning money for your family. If you are going to pay someone else to do all the things that your stay at home partner used to do, then you need to have the funds. A life insurance policy can provide those funds. If your partner has a job, it’s even more important that he or she is adequately covered by life insurance. A part-time job may not seem like a big addition to your income, but consider what things would be like if you didn’t have that money coming in. Some of the “extras” that you have in your budget might be the result of your partner’s efforts. Really think about what your partner contributes to your household finances, and keep in mind that these contributions might not be directly financial. Then, figure out how much life insurance coverage you should have on him or her. You’ll increase your peace of mind knowing that you can afford to move forward and get the help that you need if your partner passes on. Most people don’t think about life insurance for the stay at home mom or dad, but in many cases – especially when raising young children it makes a lot of sense to consider. Good post.